Obtain the best outcomes from the latest techniques with help from a "who's who" of pediatric orthopaedic trauma experts! This companion to Browner et al. 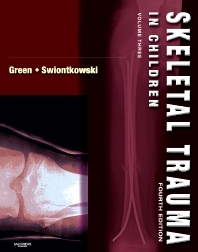 : Skeletal Trauma, 4th Edition presents practical, focused guidance on managing traumatic musculoskeletal injuries in children and adolescents. It emphasizes the unique aspects of children's fractures in terms of epidemiology, mechanisms, management, and the challenges of treating the skeletally immature patient. State-of-the-art coverage explores growth and development, pathology, complications, child abuse, sports medicine...and almost every possible break from head to toe. A new chapter on sports-related trauma helps you to manage these increasingly prevalent injuries. And, a new, full-color page layout makes it easier to locate the answers you need quickly. Complete, absolutely current coverage of relevant anatomy and biomechanics • mechanisms of injury • diagnostic approaches • treatment options • and associated complications equip you to confidently approach every form of pediatric musculoskeletal trauma. Internationally recognized contributors include pediatric orthopaedists with trauma expertise as well as specialists in orthopaedic traumatology, providing expert guidance from the most trusted authorities in pediatric musculoskeletal trauma care. A unique emphasis on outcomes assessment in children’s fractures helps you make the most valid clinical decisions. Over 800 high-quality line drawings, diagnostic images, and full-color clinical photos show you what to look for and how to proceed. An emphasis on problem-focused clinical judgment and state-of-the art treatment options assists you in making the best use of the newest techniques.